Updated Saturday, Dec. 24, 2016, 7:30 p.m. ET: On Saturday, A&E issued a statement saying it was canceling its show Escaping the KKK because its participants were paid, a violation of the network’s policy. Read more here. After facing severe backlash across social media, A&E has announced that it is revamping its documentary series Generation KKK to ensure that it doesn't normalize racism. The new docuseries title is Escaping the KKK: A Documentary Series Exposing Hate in America. The network has also partnered with ColorOfChange.org and continues its partnership with the Anti-Defamation League to create content around the show that makes it clear that the Ku Klux Klan is a hate group, not an A&E reality-television star, as it initially appeared. “After reviewing the promotions and episodes and participating in substantive conversations with A&E executives, we are pleased to see that the network is taking seriously concerns that the show—newly titled Escaping the KKK: A Documentary Series Exposing Hate in America—required important additional components, such as specific in-show educational context and content and a postshow town hall, as we both want to work together to ensure that it did not normalize and humanize racism and white supremacy," said Rashad Robinson, executive director of ColorOfChange.org. "Black communities know all too well how perpetuating stereotypes and hateful rhetoric can empower a racist and violent agenda," Robinson continued. "At ColorOfChange, we recognize the power of TV and media images, and our work is rooted in creating a less harmful and hostile world for black people and all people. We look forward to seeing updated content that adds further context to the episodes, and working closely with A&E on programming that articulates the network's intention of reversing racial hatred and violence, as well as finding ways to work with A&E and anyone else to end the rise of white supremacy and the hateful and violent tactics of the organizations that advance this ideology." At the height of the backlash, A&E doubled down on the message that the only people who had criticisms were those who had not seen the trailer for the series. In an attempt to take control of the narrative, preview episodes were sent to key civil rights leaders, organizers and media to prove that the eight-part series is intended to "expose" the KKK by showing children trying to extricate themselves from the hate group. In addition, the series follows "anti-racist activists in their work to deconstruct white supremacy." So, here's the thing. The KKK is not hidden. All you have to do is follow the black bodies, the bones buried by time along stretches of Mississippi highways and throughout the Deep South. I was a very young girl in Natchez, Miss., when the KKK marched by my house. I grew up knowing about the 1967 Silver Dollar Group's—one of the most violent KKK chapters—slaying of Wharlest Jackson. One of my uncles had a bomb placed under his car after he attempted to attend a desegregated school. My grandfather was placed under surveillance by the Mississippi Sovereignty Commission—a white supremacist organization that spied on “subversive Negroes” who even so much as thought of freedom. The commission was also complicit in the 1964 Klan murders of the three civil rights workers who traveled to Neshoba County, Miss., to register people to vote. Of course, these instances were commonplace in the Jim Crow South, but racism can't be quarantined below the Mason-Dixon Line. As previously reported by The Root, according to the Southern Poverty Law Center, in 2015 Pennsylvania had the fifth-highest number of hate groups in the United States. These groups are mostly white supremacist organizations, ranging from the KKK (nine) to neo-Nazis (three) to racist skinheads (six). The state has two more KKK chapters than Mississippi. 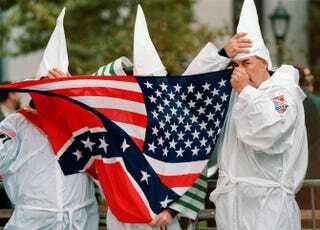 The KKK does not need to be exposed; its members are roaches crawling around in the sunlight. We know what they've done, and we know what they are capable of doing—and only someone exceedingly privileged, or opportunistic, could feign otherwise. And, quite frankly, I'm too concerned about our black children trying to navigate a white supremacist system without being gunned down by police officers to care about a little white girl crying because Daddy's racist. While I understand this may be important work, it's simply not my calling. My hometown is largely fueled by plantation economics, meaning that a large percentage of its revenue comes from antebellum home tours and racist pilgrimages. White tourists can come eat at Mammy's restaurant and stretch their legs in a place "Where the Old South Still Lives." So I'm particularly sensitive to white people’s capitalizing on white supremacist terrorism as entertainment. Because, be clear, this docuseries coincides with the mainstream media's renewed interest in the Klan. It runs parallel to Donald Trump’s incitement of racist violence at his rallies, as well as the Klan’s endorsement of him for president. At its root, interest in the KKK in this political moment is interest in Trump supporters. What feeds them? What makes them tick? Were they ignored? And I just don't give a damn. Not because it's not important to know your enemies, but because these enemies have been well-known to us for a very long time. I have the greatest respect for Robinson and ColorOfChange.org. If there is any organization that will ensure the subject matter is handled with sensitivity and integrity, ColorOfChange.org is it. A&E has moved to change its programming and I appreciate them listening and learning from the justified criticisms they faced—but the network also needs to speak dollars and cents. Any profit derived from white supremacist terrorism as entertainment—even if used as a learning tool—should go toward black-liberation organizations or directly toward economic equity in the most vulnerable and targeted black communities. If A&E announces that profits from this docuseries will be used to that end, that is when I will know that its efforts are sincere. Anything less is profiting from the blood and bones of black people. A name change won't change that.